On her maiden patrol the Cavalla was ordered to relieve the Flyingfish on June 15, 1944 at the San Bernardino Strait. En route, Lieutenant Commander Herman J. Kossler received an abrupt change of orders: Admiral Ozawa's massive attack force had been spotted by the Flyingfish steaming towards the Marianas. Admiral Lockwood instructed the Cavalla to lay in wait for the task force about 350 miles east of San Bernardino Strait. The Japanese were planning a major attack and their strategy to offset the growing American superiority was cunning and practical. Japanese carrier planes from nine carriers would attack the American fleet and fly on to land bases to rearm and refuel. Meanwhile, Japanese land-based aircraft from Guam, Tinian, and Saipan would strike from their surrounding positions and seek resupply on the carriers. This would produce a doubling of Japanese attack power. Three hours after she reached her station, Cavalla detected four ships by radar. Captain Kossler began a high-speed "end around" to pass the ships and obtain a prime shooting position. After four hours of skirting the enemy ships, Cavalla closed with the convoy. Kossler dived the boat and began plotting a firing solution. The convoy consisted of two tankers escorted by destroyers. Before he was ready to shoot, one of the escorts swung onto an attack course with the Cavalla. Realizing he had been spotted, Kossler sought deep refuge. The destroyer lingered over the Cavalla until the rest of the convoy could escape. Upon surfacing, Kossler was greeted by an empty sea. Kossler radioed Pearl that his intentions were to abandon the chase of the two tankers and wait for the warships. Admiral Lockwood deduced that the tankers were headed for a rendezvous with the capital ships to refuel them. He ordered Cavalla to resume tracking the tankers. Air activity was becoming an increasing problem for Cavalla. Japanese aircraft retarded her progress, forcing her to dive numerous times. After a long and trying day, the Cavalla's radar screen came alive. 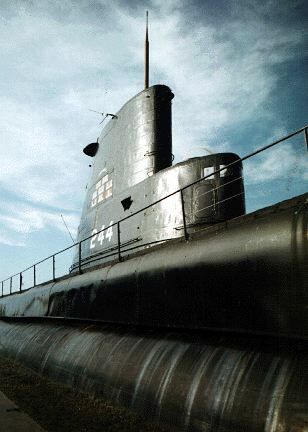 At 0800 hours, the lone submarine Cavalla had crossed the path of fifteen plus battleships, cruisers, and destroyers. Kossler now faced a dilemma. Standing orders required he report the battle group's size, speed, and course ahead of all other considerations. Kossler found himself in a favorable position for an approach to one of the carriers. But he decided to stick to orders. While following the group and assessing their strength and make-up, Cavalla was detected by destroyers and driven down. The battle group released two destroyers to deal with Cavalla. It was night before Cavalla was able to surface and send off a report of the sighting. Although the crew was disappointed and the captain heartsick, their report was of the greatest strategic significance to the worried American fleet. Now US naval planners knew exactly where the Japanese strength lay. The task force had gotten away but Kossler wasn't willing to give up the chase. Though beginning to get low on fuel, Cavalla continued to strike out after the tankers. After hours of high speed surface running, it became apparent that the trail had grown cold. Kossler turned Cavalla around and headed back for the San Bernardino Strait. Shortly after dawn, enemy air activity in Cavalla's vicinity had increased to a fever pitch. Kossler radioed headquarters and reported the position. 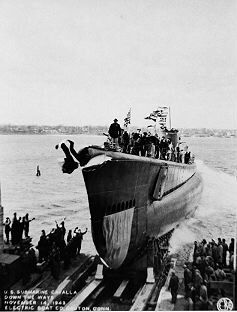 Shortly before noon on June 19, while surveying the swarming planes from periscope depth, Cavalla's sound man reported heavy screws approaching. Rushing to meet the planes was a battle group of one carrier, two cruisers, and a destroyer. It was the Shokaku, veteran of Pearl Harbor. HIT SHOKAKU CLASS CARRIER WITH THREE OUT OF SIX TORPEDOES . . . RECEIVED 105 DEPTH CHARGES DURING THREE HOUR PERIOD . . . HEARD FOUR TERRIFIC EXPLOSIONS IN THE DIRECTION OF TARGET TWO AND ONE HALF HOURS AFTER ATTACK . . . BELIEVE THAT BABY SANK. Along with the destruction of the carrier Taiho by the submarine Albacore some hours earlier and concentrated air power by the US Navy's Hellcat pilots, the Cavalla had crippled the Japanese Combined Fleet and caused the Imperial Navy to abandon their defense of the Marianas Islands and retreat to Okinawa. Cavalla's first strike had changed the course of the war. Return to the Cavalla Station.